This was the first game I played. I made a beeline straight for it. And I played it twice more after that. Everyone knows I’m a little bit in love with Assassin’s Creed. Mostly Ezio. Assassin’s Creed 3 had better not disappoint. I played the normal demo, where you play as Connor running round stabbing bad guys which was really good.. exactly the same really as the previous games but it gave us a little sneak peek into Connor as a character. And I think the combat might have been a little better.. The other demo I played was the battle ship mode! Normally I dislike games with ships cos I can’t control them for the life of me and I usually get sunk and storm off. So I actually wasn’t all too fussed about playing this demo yet, but as I was walking through the AC section a seat magically became free in front of me and I snapped it up. It was super easy to control, looked fantastic and was actually pretty fun trying to sink the bad guys. In my eyes, Assassin Creed can do very little wrong so I’m a bit biased. If you added up the amount of time I have played the Sims you’ll find I’ve probably lost a good few years of my life to that game. 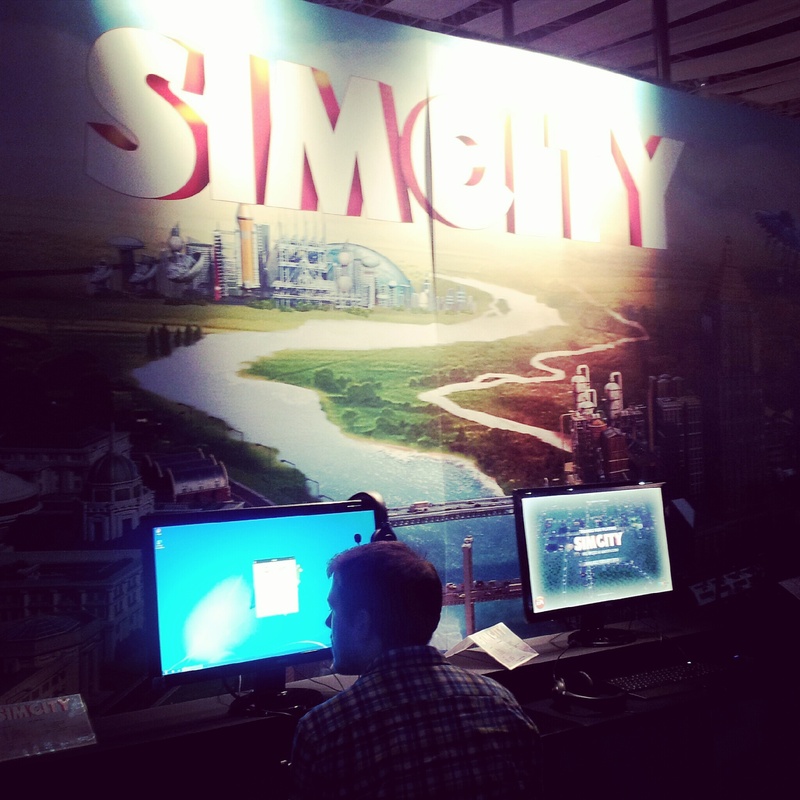 Sim City however is a different story. Maybe it was the version I had (Sim City 2000), but I just don’t understand Sim City! Why is my town dieing?! How do I put down water pipes!? WHAT IS HAPPENING?! So as I was wandering about, again.. magically.. a seat in front of Sim City became free!! I had to wait a bit to play it as every single computer running the game crashed, but thankfully my computer was the first to boot up and start the game.. and OMG. Why didn’t I go back and play this game again?! It was so much fun! Maybe it was because I understood what I was doing (thank you super easy tutorial), it was pretty funny and looked just like Sims 3.. I enjoyed it loads. I would go as far to say it was the best game I played the entire day. It’s on my list. It didn’t feel too technical to play it was just enjoyable to play. Until a meteor shower destroyed my town. ALL THAT HARD WORK. GONE. I have a girl crush on Lara Croft. Who doesn’t? This was a must play for me. I’m devastated I have to wait till next year to play it. I’ve heard people were disappointed by the demo they had on show; the survival demo, but I really enjoyed it. Yeah.. we didn’t get to kill anything (except for a deer), but we got to control the new Lara including all the jumping and shimmying, and had a glimpse at the story. I’m glad there wasn’t too much story in it, I hate spoilers! I want to experience the story for myself! After I finished playing it I was buzzing! I really enjoyed it! 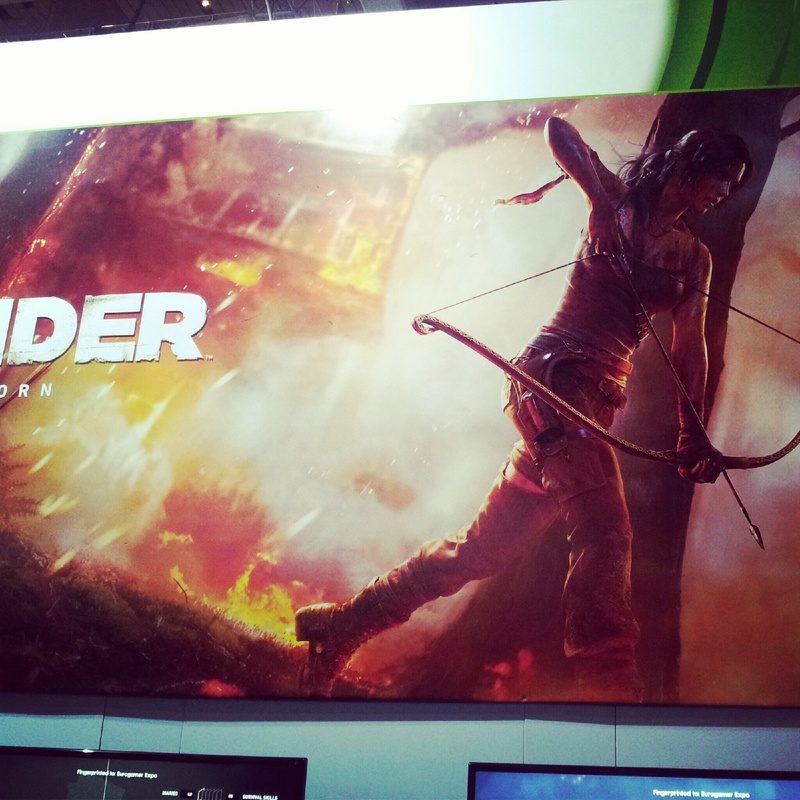 It felt like any other Tomb Raider game.. but it was different. There was something about it. It didn’t feel so linear (although I’m sure it will be).. I don’t know. It was the same but different. Umm.. I have no idea. NEXT. Yes. I am going to combine two games in one here. Right at the very end before closing, I managed to jump on Dishonoured. I’m going to be honest.. I have no idea what was happening. I have no idea what I was meant to be doing. I didn’t enjoy it. To be fair I didn’t really play it for more than 10 minutes so I didn’t devote enough time to it. But surely, isn’t that the point of a demo? I know a lot of people are looking forward to it, but I’m kinda put off it now. And the exact same happened with Hitman. That controversial trailer with the nuns? Actually made me want to play the game more. I’ve played one Hitman game in my life and I was terrible at it. I’m rubbish at stealth. I’m an “all-guns-blazing” type of girl. So I sat down and started playing and BOOM.. I’m dead. OK.. start the demo again.. running around, draw my gun.. BOOM.. I’m dead. Third time? BOOM. Dead. This went on for a number of goes. So I’ve no idea if Hitman was a good demo. I couldn’t do it. It looked really nice. Lots of people milling about in the demo and it was a good environment. Looks a lot better than the last one I played!! But other than that.. no idea. I was so lucky to get into this queue. As I went to queue the people watching to make sure no one jumped in line said they’d closed the queue cos it was getting late and I couldn’t join. I was devastated! But they took pity on me as I was only here for one day, I was wearing a t-shirt repping my company’s game, and I’d left my friend so I could queue up especially! They were so nice!! So.. 40 minutes later (the longest I had to queue all day), I made it to ZombiU. It was interesting. If you die.. you die. You start as a brand new character. I like that in a game. You have to work to survive. Games are a bit easy these days, right? Anyway, the control pad was pretty interesting to use. Sometimes the game required you to look down at it to see things on the bottom screen like a map or whatever. Or sometimes you’d hold it up and look around the screen in this 3D world to identify important things. It was weirdly awesome. The demo was dark and grizzly, and I can imagine playing that in the dark by yourself (as opposed to in a giant hall surrounded by hundreds of people) would scare the life out of you. I survived for about 20 minutes and as my respawned character I lasted even less. Like 5 minutes. Turns out killing a zombie with a cricket bat is really, really hard!! Resident Evil 6 – So much better than Resident Evil 5 (it’s not hard). I only played briefly, but what I played I enjoyed. Maybe it was just because I was playing as Leon. Oh Leon and your pretty, pretty hair. But seriously.. stop tripping over things. That got old real quick. Think I might download the demo at home and play through it again without some emo kids breathing down my neck trying to kick me off the pod. 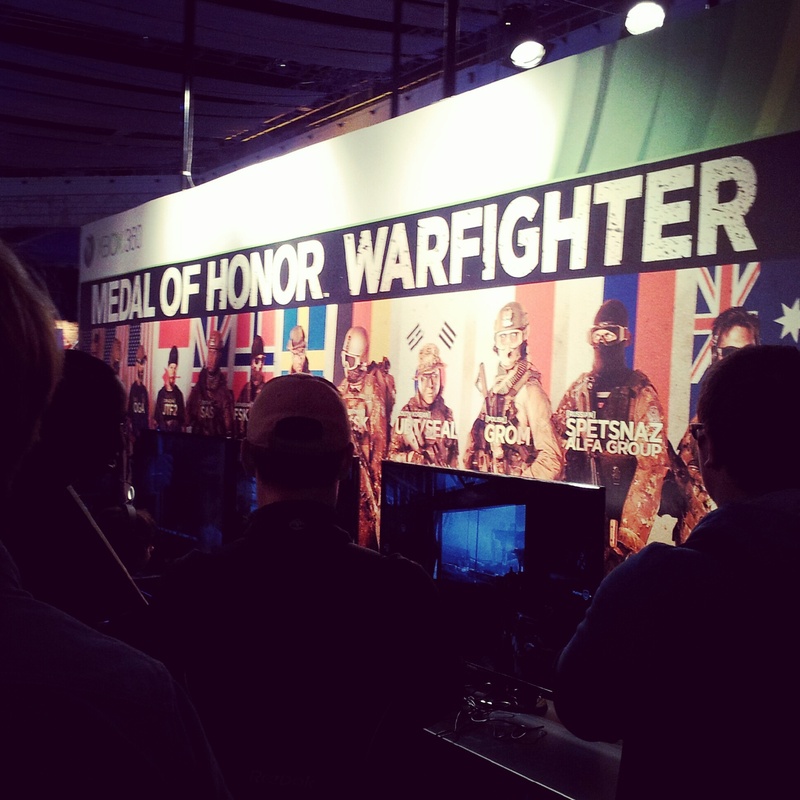 Medal of Honor: Warfighter – The last Medal of Honor I loved.. it was totally underrated. Just because it’s not Call of Duty doesn’t mean it should be overlooked. The new one was really good too. I played the single player because I much prefer playing games by myself, and yeah.. it’s an average FPS, but it was well good!! If I were to buy one FPS this year, it’d be MoH over CoD. Battlefield 3 – I know this has been out for ages, but I’ve never played it. So I quickly jumped on to give it ago (the single campaign). I really enjoyed it.. OK, yes, yes, it’s another FPS. But I really, really like FPS’s! It felt like they had the entire game on demo.. I played about 3 or 4 levels! It felt a bit clunky, but I was playing on PS3 and I can’t use the controllers. I hate them. I’ve been desperate to buy it since I came home but I can’t seem to find it cheap! I’d buy the new special pack, but £40?! I only want it for the campaign! I don’t care about online gameplay anymore. Fable: The Journey – I don’t have a Kinect but I’m on the fence about buying one. Fable: The Journey was really cool and made me feel pretty badass waving my arms around pretending I was firing spells. But I don’t know if I could play an entire game on rails waving my arms about. I don’t know if it has sword play later on so I could pretend I was a badass knight. For the novelty, it was really good! And it was Fable which I really enjoy. But.. an entire game like that? I’m going to need to pick up a controller to really DO something. It’s such a pity this game is Kinect only. Rocksmith – This game sounds really awesome and practical and is teaching you a skill. I think that’s really impressive. The game, from what I played, IS really impressive. But I found as I picked up the guitar and started playing.. I have no desire or talent to learn to play the guitar. Let’s face it, I have difficulty with Rock Band. But if you’re an aspiring guitar player, then it’d be awesome. Except you already have to own a guitar. In my house, we have more guitars than people (my brother can already play really well (he’s in a band)), but everyone in my house (except for me) can already play the guitar. So.. it’s kinda pointless. So, err.. yeah. And there we go. 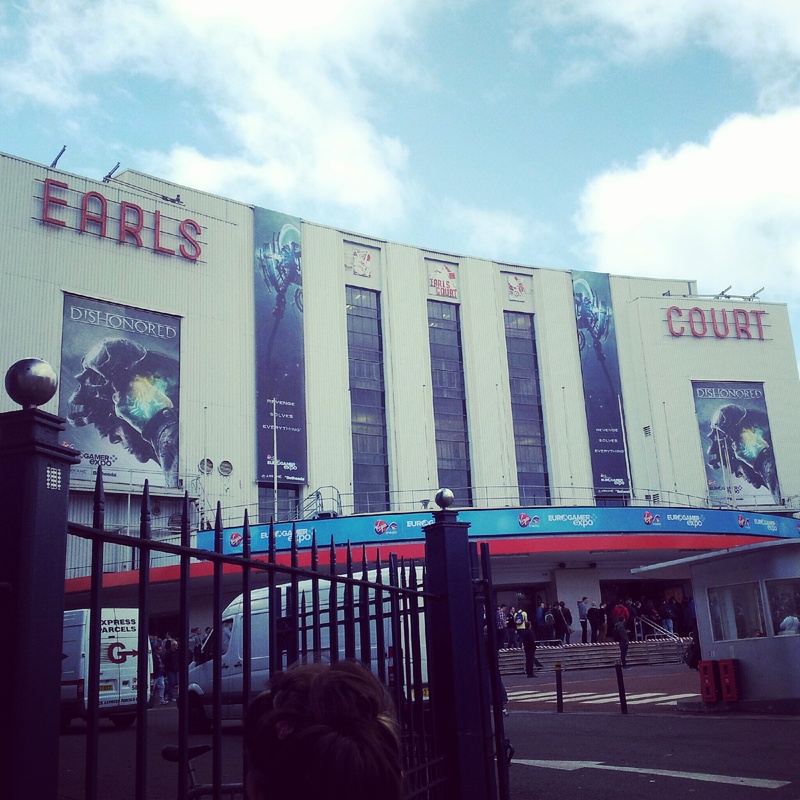 Eurogamer Expo 2012. It was great. I was exhausted afterwards. And I do wish I could have gone for an extra day to replay some demos and justify standing in queue for certain games (Gears of War: Judgement, CoD Black Ops 2, Halo 4).. but there’s always next year!! If you’ve ever fancied going to a gaming expo but have never been sure, even if it means going by yourself, you should definitely do it. You’re surrounded by like-minded people and you get the chance to play some demos of upcoming games. There are competitions and tournaments.. and free stuff (albeit, not a lot (this year they had photo booths for certain games WHICH WERE AWESOME))! I seriously can’t wait for next years. else realize such specific approximately my problem.